A couple years ago, I stumbled onto a non-paternal event after discovering a birth certificate for my paternal grandfather that listed his father as Jimmy Kirk. Jimmy Kirk was not my great-grandfather's name. At least not the name of the man I believed to be my great-grandfather. Shortly after this discovery, I heard a family rumor that my great-grandmother had a relationship with a man who worked at the water reservoir beside her home. Family Mystery Part III: Are You My Grandpa? I identified Samuel James Kirk as the likely candidate for my biological paternal great-grandfather, but I still needed something more than conjecture, rumor, and hunches to give me solid answers on which I could stake my surname. Could there be a role for DNA? Samuel James Kirk was the son of William Frank Kirk. In total, Samuel had ten siblings (six brothers and four sisters). Unfortunately, they're all deceased. To find answers, I would have to move on to the next generation. One of Samuel's brothers had a daughter who is still alive. I found an address for her, wrote her a letter, and over the course of several months she shared information on her Kirk family history. In November 2014, she agreed to take an autosomal DNA test with Ancestry.com. An email finally arrived with the long-awaited news that her results were in; however, it took a full day for her genetic matches to populate. The wait was torture thrilling! Her four closest matches were (drum roll, please...) my father, my aunt, my uncle, and myself. Bingo! DNA had confirmed a winner. Ancestry.com estimated her relationship to my dad and his siblings as second cousins. In actual fact, they would be first cousins once removed. This relationship prediction aligned exactly how I would expect it to if Samuel James Kirk was my great-grandfather. 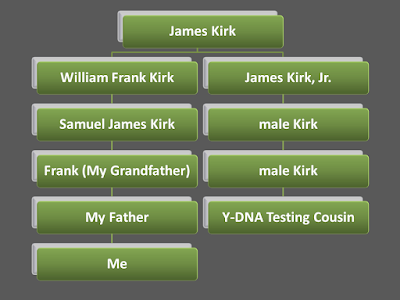 Based on this genetic evidence, I had finally latched onto the correct Kirk family. Great-grandma did indeed have a very friendly relationship with the reservoir watchman! After the autosomal DNA test connected me to the correct Kirk family, I began mapping out the family tree. I wanted to locate a direct male Kirk descendant to further confirm the initial DNA results. In preparation, both my father and I took Y-DNA tests with FamilyTreeDNA. 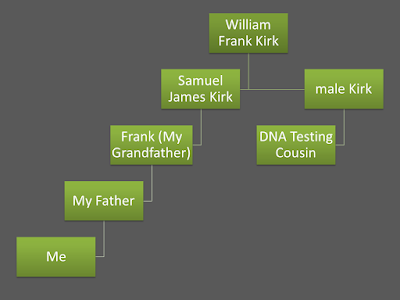 My Kirk genealogy determined that William Frank Kirk was the son of James Kirk (1830 - 1917). James and his wife Hester Griffith had eight children, including James Kirk, Jr. Following James Jr.'s descendants, I eventually landed on a male Kirk cousin living in the Midwest. Judging by our family tree, he would be my third cousin once removed. But would the DNA confirm the relationship? I mailed him a letter explaining my interest in researching the Kirk family tree, and then I asked if he would take a DNA test. (It must be so odd to receive a request like that out of the blue!) He wasn't weirded out. I received a phone call from the cousin. He was on board. I had a Y-DNA test kit shipped to him and after several months (it took him a while to actually take the test) the sample was at the lab for analysis. In early July 2015, his results came back. He was a very close match with a genetic distance of 1 (on a fast changing marker) for 67 markers. 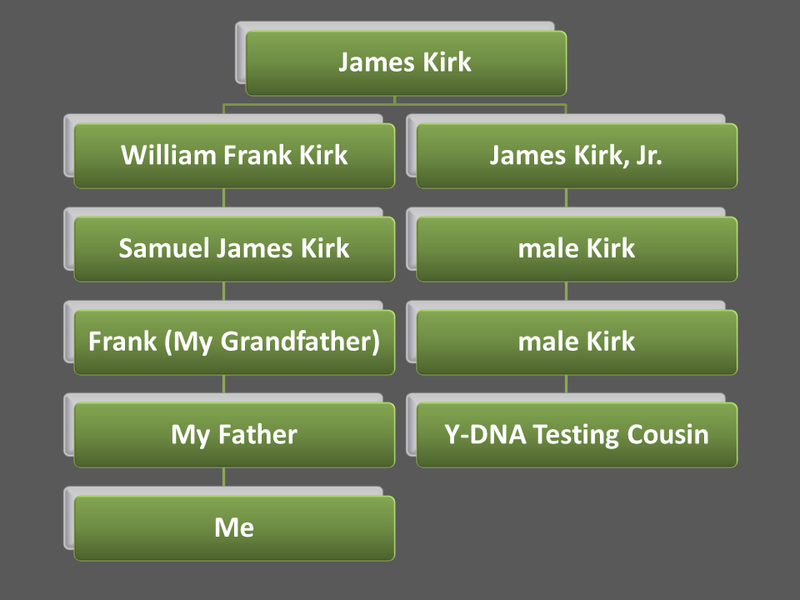 Based on those results, it was safe to say that we did share a common male ancestor - James Kirk - as the paper trail suggested. Again, DNA had reinforced the case for my link to the Kirk family. 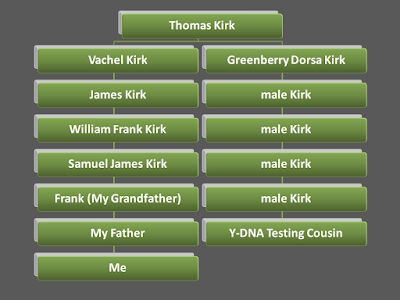 While I was waiting for the Y-DNA results to arrive, I continued researching the Kirk family tree. I was able to push the paternal line as far back as the paper trail currently supports. The furthest my male Kirk line can be traced is to a man named Thomas Kirk (c.1778 - 1846) who was married to Sarah Louise Bonar and lived in Licking County, Ohio. After one non-paternal event, you get a bit skittish and begin to only trust the science. 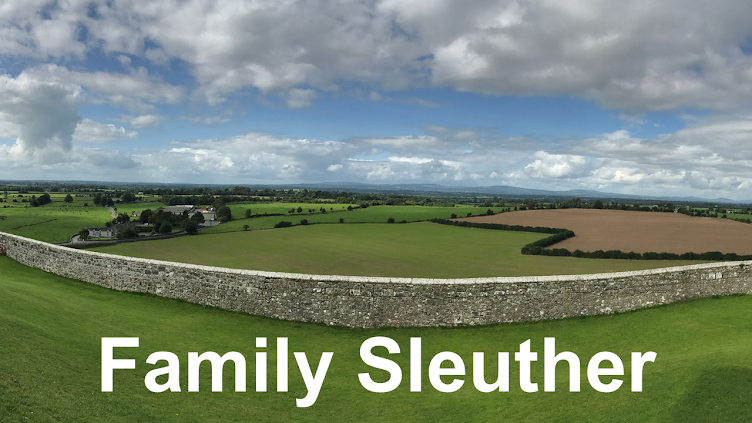 The truth DNA brings to genealogy is both refreshing and a confidence builder in the accuracy of your research. Could I genetically confirm Thomas as my 5th great-grandfather? I would need to find and test another direct male descendant of one of his sons. Fortunately, Thomas had 12 children. Nine of them were boys. There was no shortage of Y-DNA to track down. I descend from Thomas' eldest child Vachel Kirk. Zeroing in on Thomas' eighth son Greenberry Dorsa Kirk, I eventually found a direct male descendant who was willing to take a 67-marker Y-DNA test. In late August, his results came back. He was a close match to my father with a genetic distance of two (the same fast changing marker mentioned above and a slow marker). The test again reinforced the paper trail: I am a descendant of Thomas Kirk. The entire mystery of my grandfather's paternity would not have been solved with any level of confidence without the DNA tests. Genetic genealogy is now a fundamental tool in the genealogist's toolkit. In fact, DNA will likely play a key role in helping to learn the ancestry of Thomas Kirk and his national origins. I look forward to the adventure and my newfound role as a citizen scientist. Now where did I put my lab coat? Fascinating! Even some of my own family are reluctant to take DNA tests, so you must be very persuasive! I've been fortunate that my requests have been met with a willingness to test. DNA testing really is becoming an essential part of genealogy. I think more folks will warm to the idea with continued promotion on TV, internet, etc. It's going mainstream. Thanks for following the blog. I appreciate it! My first experience with Y testing revealed that one of the researchers with the best paper trail had traced a paternal line that was not his. His line was that of the neighbor of his great grandparents. Since then each match I find confirms my paper trail even when it does not add new leaves to the tree. One of the confirmations was that my great grandmother, born between 6 months and 18 months (by records) after her father died, was his child and the 6 months date after his death for her birth the supported one. Yes, exactly the power and value of genetic genealogy! Your examples and my own experience have taught me that DNA really is indispensable to today's modern genealogist. Thank you for sharing this! This was a fascinating and inspiring read. Thanks, Jeff, glad to have you stop by and appreciate your comments. I look forward to checking out "Inspirational Genealogy". Great story -- I have a similar one learning in my 50s that the person listed on my birth certificate was not my biological father.Again DNA testing was the clincher. Thanks DrJimSel. I appreciate the compliment. It's gratifying to know that if we're going to be surprised by a non-paternal event that DNA testing is advanced enough to help unravel the mystery and offer an answer.